This image shows how the Jupiter and the moon will appear at 6 p.m. EST – about one hour after sunset – on Super Bowl Sunday, Feb. 6, 2011. Skywatchers hoping for a cosmic post-game show after the Super Bowl on Sunday (Feb. 6) may get their wish. If the weather is clear, Jupiter and the moon promise to give an eye-catching sight just after sunset. 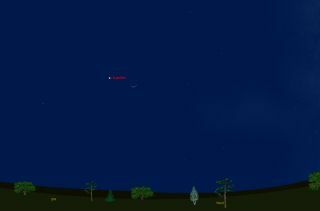 About an hour after sunset (local time), Jupiter and the moon should appear above the western horizon, about one-third of the way up into the sky. It should be a rewarding sight: A lovely, thin waxing crescent moon accompanied, on the left, by a brilliant silvery white "star" – the bright planet identified by the supreme sky-god Jupiter. To judge how far apart they will appear in the sky, recall that your clenched fist, correctly held, will measure 10 of those degrees. Jupiter and the moon will be 7 degrees apart Sunday night. So you can use your fist to make a reasonable estimate of degrees either horizontally or vertically. Yet even though they won’t appear too close together, both the moon and Jupiter will likely attract the attention of many of those who aren’t consciously looking up at the sky. No doubt many people heading either to or from Super Bowl parties will briefly pause or admire this attractive celestial tableau. The display will appear to slowly descend down the western evening sky, finally disappearing beyond the horizon at around 9 p.m. EST (0200 GMT). Jupiter is still the brightest starlike object in the evening and the first to come out each night at dusk. It still outshines the brightest stars in the sky now. In fact, Jupiter is nearly twice as bright as the brightest of all the stars, Sirius, which in early evening sparkles low in the southeast sky. Note how Jupiter shines with serene steadiness while Sirius twinkles vigorously, as if struggling to match Jupiter’s glory. But during February, Jupiter will slip farther down into the glow of evening twilight in the west-southwest. And by the end of February, it will be setting right around the time evening twilight ends. This month, Jupiter is falling far behind Earth in the never-ending planetary race around the sun and it continues to move slowly eastward among the stars — though because of the constellations’ irregular boundaries, it will briefly clip a corner of the non-zodiacal constellation Cetus, the Whale from Feb. 25 to March 6.